The consulting domain continues to remain a favourite of most MBA grads. Strategy consulting firms pay well, and compared to banks, they offer more intellectually stimulating work. As The Economist puts it, MBA grads have begun to put up with being merely affluent, rather than become obscenely rich, and choose consulting roles over investment banking. Of course, the financial crisis and the consequent reduction in hiring at top investment banks would have also been a major driver in the change of candidate preferences. Hiring at consulting firms remained robust throughout the financial crisis, and this domain has consistently featured in the top two preferred domains in our Recruitment Survey over the last three years. However, one must remember that not all consulting roles are the same – strategy consulting roles are more sought-after than other types of consulting roles like process consulting or IT consulting. 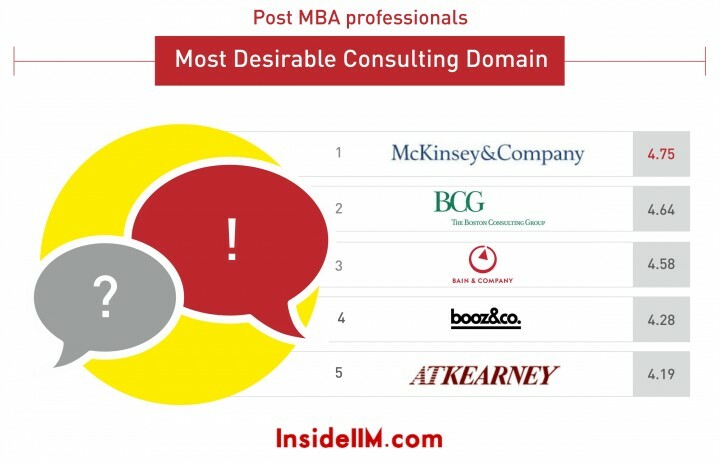 The halo effect created by the strategy consultants is an important reason why the consulting domain is so highly ranked. The reality is that strategy consulting firms visit very few out of the top ten campuses, and they are extremely selective in their hiring, so getting into one of these firms is a distant dream for most. General management roles have witnessed a steady rise in their popularity over the last three years. 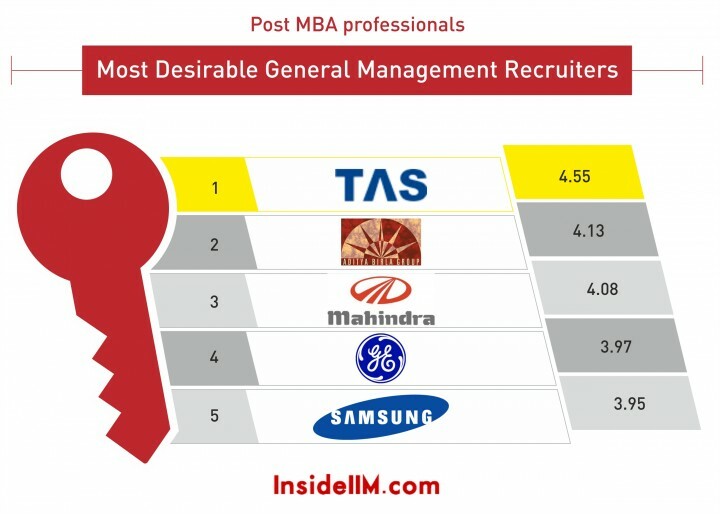 The percentage of candidates preferring general management roles has increased consistently over the last three years, and general management has now firmly grabbed third spot in the list of preferred domains, after sales & marketing and consulting. Reasons for this include good exposure to all aspects of a business (a benefit found only in some consulting firms – that too, if you are lucky), job stability and work-life balance (benefits not found in investment banking or strategy consulting firms). Let us see how students from top schools in India have voted to confer the most preferred firm tag. The survey is based on responses of 900 people. The class of 2015 (who selected Consulting as their preferred domain) and Post-MBA professionals (who are working in this domain) were asked about their preferences about working in each company on a scale of ‘Most Desirable’, ‘Highly Desirable’, ‘I’m Confused’, ‘I do not wish to apply’ and ‘I have never heard of this company before’. A mean score was calculated where Most Desirable is scored as 5 and I have never heard of this company is scored 0. The resurgence of McKinsey continues. After being ranked 4th in 2012, it surged into joint-top position with BCG in 2013. This year, McKinsey is on top all by itself. The opinion of industry professionals matters a lot because they have the best idea about the jobs, profiles and companies in their industry. BCG moves down to second place. Tata Strategic Management Group continues to hold down an impressive 8th position having entered the top ten last year. The rest of the list is quite predictable, just like the work done by most strategy consultants. Perceptions in this category of respondents will be informed by summer internship experiences, feedback from alumni, company’s activities on campus etc, i.e. the respondents from second-year MBA have much less first-hand information than industry professionals, but will still have a decent idea about profiles and roles. McKinsey, BCG and Bain continue to enjoy their stranglehold on the top three slots, in that order. Following that, the big movers from last year are Strategy& (formerly Booz & Co) which has moved into fourth place. 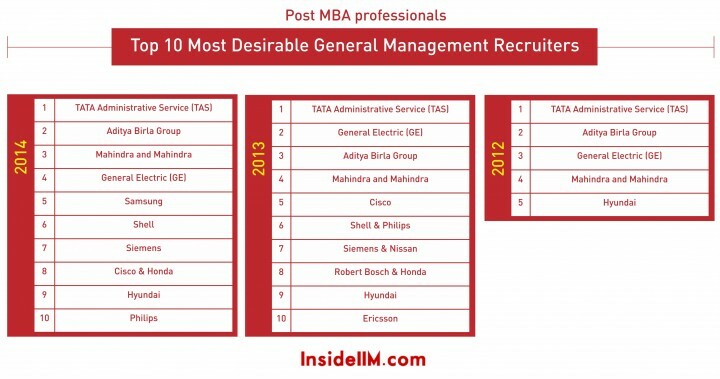 Seen over a three year time period (from 2012 to 2014), we don’t notice any great changes in this list apart from the entry of Tata Strategic Management Group in the top six. Recruiter rankings in this segment of respondents (Class of 2016 and MBA aspirants) are in most cases, purely a function of brand perception. There is very little quality information about roles and profiles available for new joinees and MBA aspirants to base their decisions on. A company that has a less powerful brand, but offers a decent profile and a decent chance of landing you a job will have been rated highly in the earlier two segments of respondents. It will not be rated highly in this segment, only the biggest brands will win. The big news in this segment is that BCG has managed to dislodge The Firm (McKinsey) from top slot, albeit just narrowly. 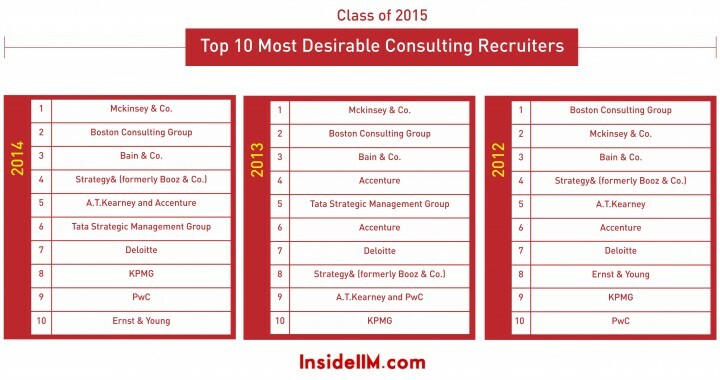 The top three slots remain the exclusive preserve of BCG, McKinsey and Bain. 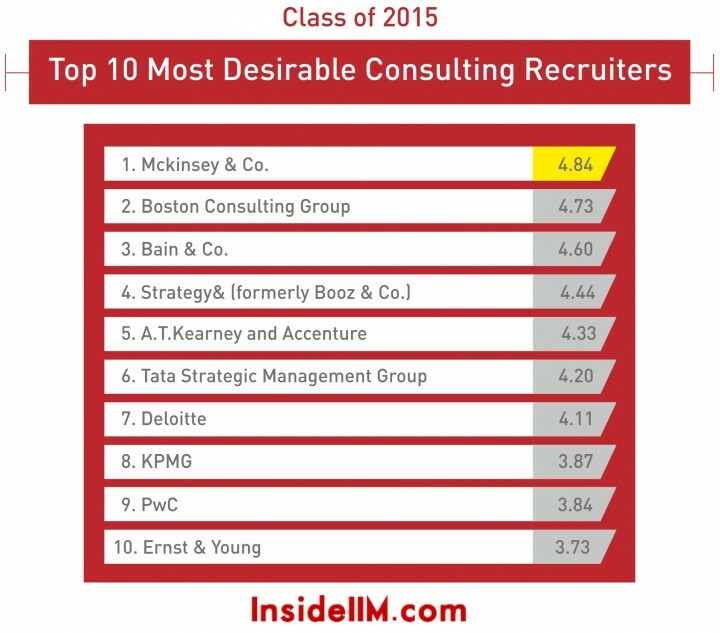 Among the rest, AT Kearney, Ernst & Young, and KPMG have risen impressively in the rankings. Booz & Co seems to have slipped a few places in rating among MBA newbies, but this could be because of the change in name which would lead to less familiarity with newbies. 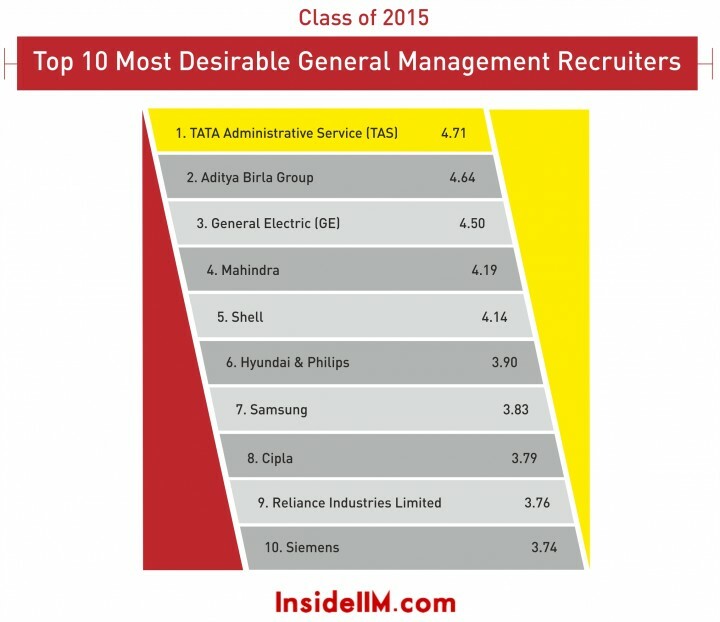 Tata Administrative Services continues to maintain its top position in general management, by a healthy margin. The main change from last year is that the Aditya Birla Group (ABG) and Mahindra & Mahindra have leapfrogged GE into second and third place respectively. 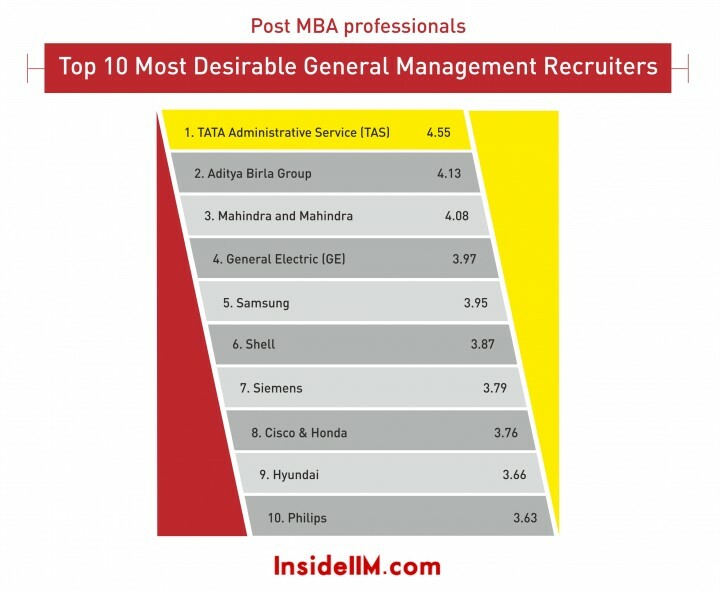 The Indian conglomerates are alive and well, and they are definitely posing very interesting challenges to entice MBA grads. The rest of the list in General Management is composed exclusively of foreign MNCs. Samsung makes an impressive entry into the top five this year. Again, TAS tops the charts, but the gap is slightly narrower. The Aditya Birla group is a close second, followed by GE which climbs one place to third, swapping positions with Mahindra & Mahindra. Cipla and Reliance Industries are the other Indian representatives in a list that otherwise features foreign MNCs. Samsung makes an entry into the top ten at 7th position and Siemens slips a few places to 10th spot. 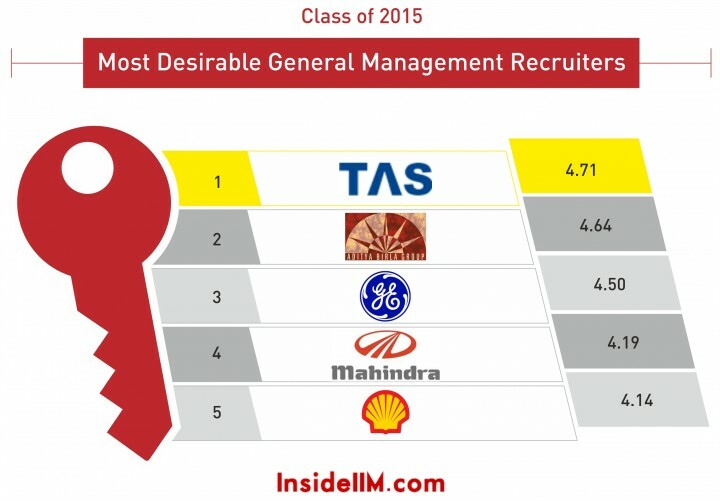 TAS wins this easily, and the top for are same as the list for the Class of 2015. Reliance Industries rounds off the top five. The interesting trend to notice is the preponderance of Indian firms in the top ten (five including TAS, ABG, M&M, Reliance and Cairn India). 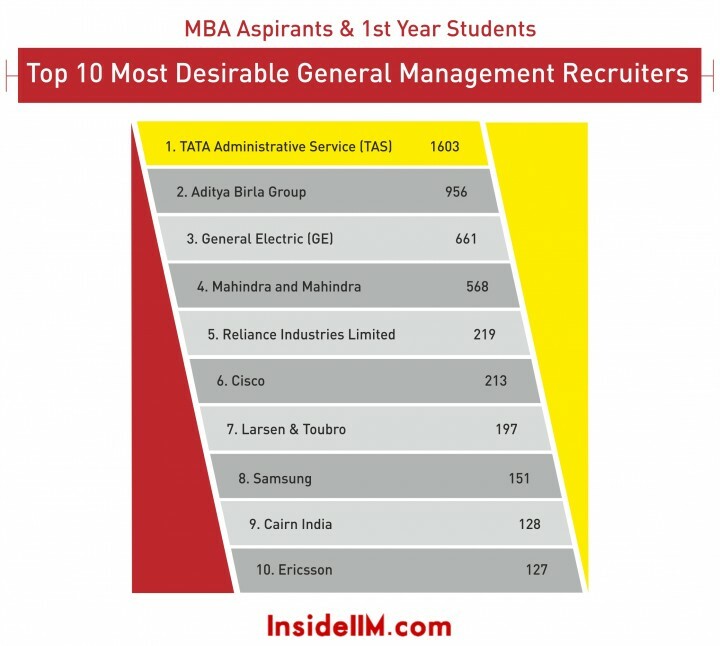 As we had said earlier, the rankings by Class of 2016 and MBA aspirants are based mainly on perception rather than first or second hand data, and the fact that Indian conglomerate firms are showing up in the top ten means they are doing something right. 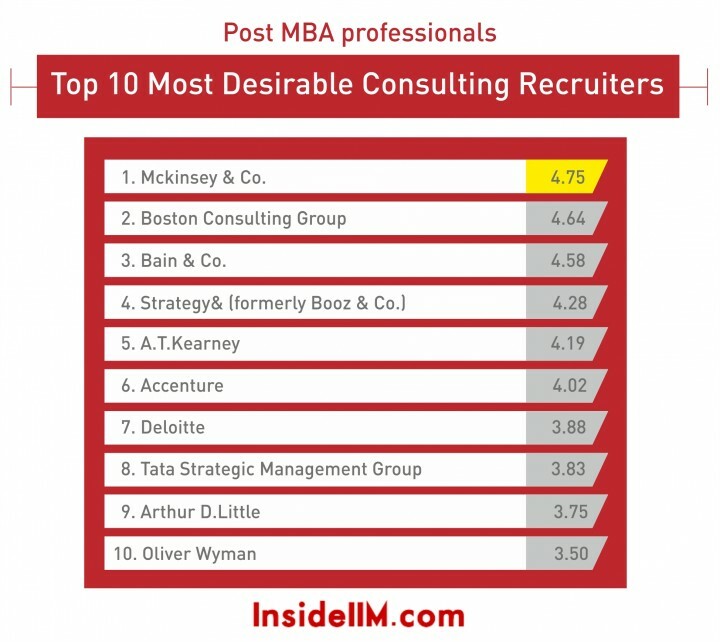 Hiring by consulting firms has always been strong even during downturns. General management roles are growing in popularity because they offer a combination of diverse functional and business exposure, job stability and work-life balance. 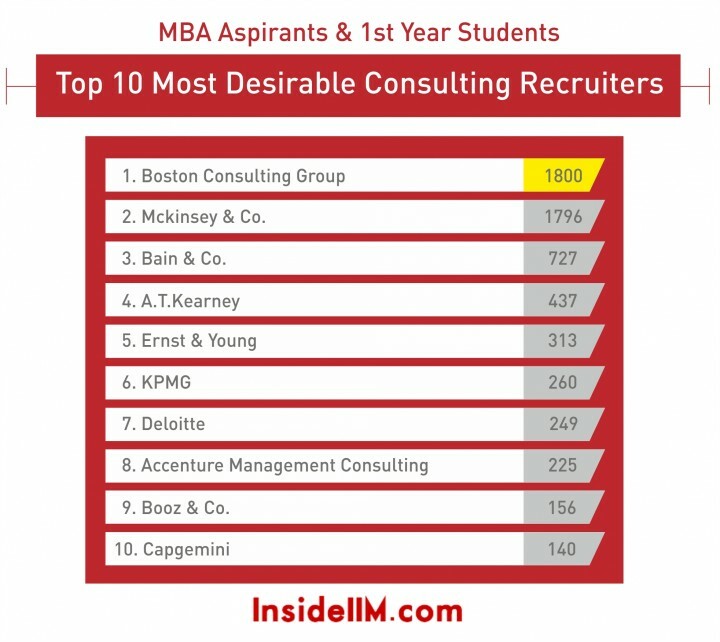 Companies like McKinsey, BCG, and TAS have consistently topped the rankings over the last three years across categories, and it appears that they will have no difficulty in attracting the best talent. The strong performance of many Indian conglomerates in general management (especially among Class of 2015 and Class of 2016) bodes well for their future.